These are top 20 best and the most used extensions and apps dedicated to Google+ that I found until now in the chrome web store. 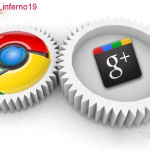 These extensions will make a much better Google+ on your Chrome browser. If you have found other most interesting ones, just leave those in your comment. Tweaks to the layout and features of Google+ (Google "Plus") Full width, thumbnails only, etc. Colorizes Google+ and Facebook based on the user's photo. Please share this to all the Google+ users. How to increase your YouTube video views?